I am very anxious to learn how you all fared in this terrible time of earthquake and have not been able to get a telegram through to you, so I am writing today and hope it won't be too long before I get news of you all. It has been awful in Kingston, nearly the whole city destroyed and many killed. Out this way all the houses are badly damaged but I am glad to say no deaths. Belmore is pretty bad, only the drawing room that still holds together - the walls in your bedroom & the small room have given way, and the dining room & pantry also, all the outrooms & office are falling down. Pumpkin Ground & Farm are totally wrecked & Cedar Grove about the same as Belmore. I have been staying at Spanish Town since that evening. Dodds' house is the only one that holds together and has suffered very little - three families have been camping there. The hospitals, or all that is left of them, are full of wounded people. I am thankful that J and Alice left Kingston before this occurred. Nelly is getting on well & I hope will soon be about again, but poor old Wm Gibb who was attending her has been killed. The earthquakes still continue at intervals of from two to six hours but the shocks are diminishing I think, & I hope we are over the worst. Write soon dear Mother, I am very anxious about you all. 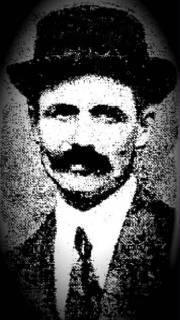 Edward Scarlett Galbraith was Superintendent of Farms for the United Fruit Company. He died in May 1945, aged 77, some two years after the death of his son, Ivor, who was serving in the R.A.F. in World War II. 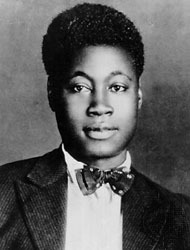 Claude McKay, then a teenage boy had been sent from his home in Clarendon, to Kingston to attend Mr. Peet's Trade School [later to become the Kingston Technical High School]. He had received a wonderful send-off from the folk of the villages around his home in Sunnyville near Frankfield. They had wined and dined him and bestowed on him gifts of neckties, suspenders and handkerchiefs. Then with a new set of clothes provided by his family he had set out in his father's dray for Chapelton where he took the train to Kingston. He was reading in bed in his room on Tower Street when the earthquake began. It seemed to him that some great giant had suddenly crushed in the walls of the house and he ran into the yard. There he witnessed bricks of a nearby building falling down, people running and screaming along the road, all in panic. One man climbed the coconut tree in Claude's yard and when he reached the top shouted, "I am going up to heaven, Lord! I am going up to heaven!" Three shocks followed the first one. Soon fire broke out and the city was ablaze. Later when Claude went to the centre of the city to look for his cousin he saw bricks and the rubble of buildings piled high, many trapped persons groaning, dead bodies all around and the stench of burning flesh. He discovered his cousin and sickened by his experience returned home. Mr. Peet's Trade School was demolished in the cataclysm and Claude's cousin advised him to return home. They then visited Victoria Market where they found a dray that belonged to a man who was a close friend of Claude's father. Having procured this transportation they returned to Claude's Tower Street address, collected his possessions and returned to the market. As the dray in which he rode made its way along the roads leading away from Kingston he observed lines of people - refugees from the earthquake with bundles on their backs. Others were coming toward the city looking for their relatives and asking the draymen for individuals they knew. When Claude's transport reached May Pen it was night but he was spotted by his father. Old Mr. McKay had left home to search for his son and had used the same method of other seekers, calling out to each dray that passed. Stern Victorian father though he was he was so relieved to see his son alive that he hugged him and kissed him. And the villagers of Claude's district who thought he had been killed were delighted that he wasn't. They celebrated their joy at his safe return with a picnic. 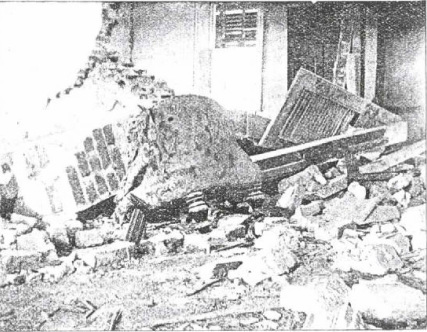 There are many interesting eye-witness acounts of the earthquake in the Daily Gleaner, especially in the accounts of the court cases dealing with insurance issues, which began in late 1907. In the account by a barmaid working on Harbour Street I was most intrigued by the fact that - she went back for her hat; no respectable woman in those days, and long after, would be seen outside on the street without a hat on - even in the midst of an earthquake! On the 14th of January last I was employed as a barmaid at the Arcade, No. 94 Harbour Street, which ran right through, from Harbour Street to Port Royal Street. As one entered the store from Harbour Street there was on the right hand side a wholesale counter and it contained rum, whisky, and other liquor. There were many bottles of liquor on the shelves I cannot say how many shelves were there, but there were more than two. On this same side of the store there was an office, and there were also puncheons containing spirits. At the north corner of the premises the Arcade Bar was situated, but it did not run from Harbour St. to Port Royal St. It only went a little way down the store; less than halfway. I was an assistant in the bar. Glasses were left on a marble stand behind where I stood. There were puncheons and many bottles upstairs. When I felt the shock of earthquake I was near the counter. At that time there was no sign of smoke or fire in that place at all. Mr. Tobin: What did you do when you felt the shock? Witness: I stayed where I was until it was over and then ran out to the Harbour Street entrance. I felt rum falling from the ceiling as I ran out of the bar. I ran out immediately after the shock – about two seconds after the shock was over. When I was outside, I saw Mr. LeRay, who was employed at the Arcade. I also saw Charlie, a storeman, - who worked on the same premises. Charlie was lying in front of the Arcade right at the door. There was a woman lying close to him. I noticed that the iron bar of the Arcade had fallen. The front part of the store had gave way. It had fallen into the street. I could see the front of the Army and Navy store. Some of the upper wall had fallen in. standing up outside. I stayed outside the Arcade for five or ten minutes and I went back into the Arcade for my hat, and on coming out back, I was asked by Mr. Eggins to go into the bar again to get a bottle of three star brandy for a man who was dying near by. When I went back into the bar there was no sign of smoke or fire at the Arcade. When I came out of the bar with the brandy I saw black smoke coming from the Army and Navy store. It was coming from the middle of the store. I saw slight flames also coming from the Army and Navy store. There were no flames whatever in the Arcade. I then left and went home. His Honour : Why did you say it was rum that was coming from the ceiling? When you went back to the Arcade, did you notice the glasses on the marble stand? A few had fallen on the ground. Did you notice anything about the bottles in the wholesale department ? I could not see there, I got the bottle of Brandy from the locker in the bar, which was full of bottles. Dr. Vaughan Cornish and his wife were returning from a visit to the Panama Canal and stopped in Kingston on their way back to the U.K. Dr Cornish was very interested in the study of 'waves' in all 'spheres'. 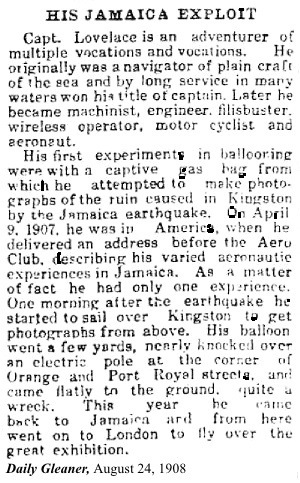 He returned to Jamaica later in 1907 and he will feature again on a later page. No. 3. MARCH, 1908. Vol. XXXI. By VAUGHAN CORNISH, D.Sc., F.R.G.S., F.G.S., F.C.S., M.J.S. On Thursday, January 10, my wife and I arrived at Kingston on our way back from a visit to the Panama canal, and took up our quarters in the centre of Kingston, at 112, East Street. This hotel,'The Grenville,' which was built in the days of slavery, was very substantially constructed of brick, with solid walls 14 inches in thickness for their whole height of two floors, viz, a ground floor and a first floor. The roof, a sloping one, was of wooden shingles, and in the whole structure there was no chimney-stack, fires not being used for warmth in Kingston, and the kitchen being always separate from the dwelling-house. In front, that is to say on the west, of the house a row of massive brick arches formed a verandah to the ground floor, and supported a covered wooden balcony on the first, floor. Our own room was a corner one on the first, that is to say the top, floor, having an outside wall to the south, and another 14-inch thick wall on the west, with two long French windows opening into the balcony. In this room my wife and I were sitting at half-past three in the afternoon of Monday, January 14, when I heard the noise of an electric car coming from down town, that is to say, from the south. The noise increased, of course, till it was opposite the house, and then just as the rushing should have begun to diminish, there was a sudden and alarming increase of rushing and rumbling sound, accompanied by a savage tearing and rending noise. For a moment I felt no shock and did not realize the cause of the uproar, but my wife, who was sitting nearer the wall, felt a tremor, and, realizing that it was an earthquake, took one quick step to my side and clasped her arms over my head to shield me from the danger of falling masonry, to which she herself thus remained exposed. The next instant the whole house was rocking violently; a fissure opened horizontally near the top of the west wall facing me, and a shower of brickwork fell near the threshold of the door. Had my wife hastened to the door on feeling the shock, she would probably have been struck down at the moment of emergence, as happened in so many cases that day. A cloud of dust and mortar darkened the air, and the solid 14-inch brick wall vibrated to and fro, discharging a cannonade of brickwork into the room. A lump of masonry struck me a numbing blow on the shin. A heavy mahogany wardrobe behind me, but facing my wife the way she stood, executed a clumsy dance, and then pitched over; and the heavy cornice sailed over our heads and struck my wife on the hip in its descent.. We were being bombarded both front and rear, but, even had there been any direction in which safety could be found, we were unable to fly, for the timber floor was like quicksand beneath the feet, rising and falling, and opening and shutting, so that we could see into the unceiled room below. Up to this point, one knew that these occurrences might at any instant terminate fatally, but the really awful time came when the house seemed suddenly to lose its cohesion, and we both realized that in another second the floor would give way and the walls fall bodily upon us. Then instant death seemed certain to both of us; but, strange as it may seem, the bitterness of death passed from us both almost instantly after the hope of life had been extinguished. I remember to have felt that such an end, instantaneously and together, was not unmerciful. At this supreme moment, with absolute suddenness, the quaking floor stiffened under our feet, our environment was instantaneously rigid and still, and the noise of the earthquake died away. We rushed from the dark and dust-laden room into the verandah, and down the steps into the sunny garden, where the earth was now quite firm beneath our feet. We spent the next few days on the lawn by the house, and on the Thursday we left Kingston for Port Antonio, on the north of the island, the train being crowded with sick and wounded. A week later we sailed for England via Philadelphia and New York. During our short. and eventful stay in Jamaica we had been much impressed by the generous spirit displayed by the colonists in the face of great financial losses. They scrupulously refrained from exploiting the public misfortune for private profit.. We were also much struck with the kindliness which they displayed to one another under very trying circumstances, as well as with the consideration which they showed towards the strangers within their gates. There was no tidal wave in Kingston; there was a small one on the north side of Buff Bay, but of no particular moment. The Parade, which is a large park in the centre of the city, was thronged with refugees all wrought up to the highest pitch and a large number of wounded were laid around everywhere among the shrubbery. The condition of these poor sufferers was lamentable, but there was no help as the city hospital was already congested. Then it was that some foolish person started another panic by crying out that a tidal wave was coming. Ever since the great shock happened, there have been persistent rumours that the town would be overwhelmed by the sea, and there was a widespread fear of this among all classes. As this rumour gained headway, all the streets leading out of town were thronged by the frantic inhabitants who praying aloud and shrieking in terror rushed pell mell towards the upper portion of the city where they passed the rest of the night singing hymns and howling that judgement day was at hand. The sisters had hardly retired to rest that night [Tuesday 15] under the trees when a strange noise was heard passing before their compound; it sounded like a sea of human voices growing louder as it approached. Threatening rumours of escaped prisoners and inmates of the Insane Asylum had already reached their ears; and as the crowds, in thousands, were passing Alvernia's ruined gates, each sister wondered what new danger was at hand, afraid to communicate her thoughts to another. Then a man ran through the gates and breathlessly said that the governor had ordered the whole population of the city to move northwards towards the mountains, since a tidal wave was imminent. The sisters were terrified, and the children more so. Among the boarders were a good number of young ladies from South America who understood English only imperfectly. When they heard the word ‘governor’ and were told to flee, they took it for granted that the government, like their own governments, had exiled the sisters. They begged to be allowed to follow their teachers into exile. It took some time to quiet them and explain what the real danger was. Since they were two miles from the waterfront and 250 feet above sea level, the superior decided all should remain at Alvernia. Quietly they again sat down under the trees and some had already fallen asleep when a messenger on horseback rode madly into the compound, saying that the sea had already covered the lower part of the city, and begged the sisters to run as fast as they could if they wished to save their lives. Each sister took as many children as she could and started on the march. Hardly were they outside the gate when a constable came from the nearby police station with official news that no orders had been issued by the governor and that the sea was perfectly normal and calm even in the ocean beyond Port Royal. Who spread the false, terrifying news never became known. Back went the sisters and children to Alvernia, worn out by terror, and all fell asleep under the convent cottonwood trees. The soldiers ignored the 'tidal wave' threat! On this occasion the soldiers of the British West India Regiment performed their duties well, as indicated in the item from the West India Committee Circular. The citizens of Kingston were accustomed to have their streets invaded by the Regiment's soldiers from time to time as they carried on their on-going feud with the men of the Constabulary Force; in this crisis in must have been a relief to see them acting professionally and responsibly! Lord Frederic Hamilton arrived in Jamaica from Colon shortly after the earthquake and stayed at King's House; he gives an interesting account of conditions at the Governor's residence shortly after the 'quake. 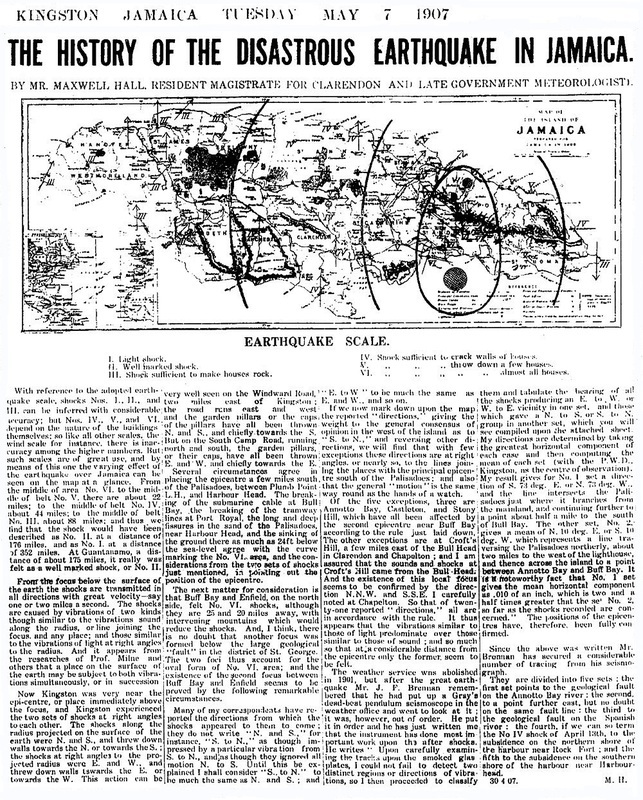 Thanks to the excellent international telegraph connections which existed in 1907 (Jamaica's international telegraph links dated from 1870) news of the Kingston earthquake was rapidly received worldwide. Even so the reports in the first few days after January 14 were very confused and confusing. The Associated Press had to explain that its bulletins sent under a Kingston date of January 16 had only reached them that afternoon and might well have been delayed by the great press of official business on cable lines. It was possible that these dispatches had been filed at a time when excitement was great and before later and probably more accurate estimates of the number dead and injured had been available. Hall Caine wrote of the limitations on telegraph communication - the capabilities of one wire, the pressure of Government work keeping the Colonial Office informed, the messages in response to urgent inquiries from relatives and friends. His report, the earliest long one to get out, appeared in the New York Times on Sunday January 20 and a day later in the Daily Mail in London. Reports are current that Kingston, the capital of Jamaica, has been demolished by a violent earthquake, and that the disaster has been attended by great loss of life. There is little at present to substantiate this beyond the fact that Kingston has been cut off from cable communication, and the Western Union Cable Company believe the cable has been severed by an earthquake. The cable via Key West and Cuba, and also that via Bermuda, have failed to connect with Kingston since this morning. The greatest anxiety is being experienced here, and further news is awaited with impatience. An attempt was made yesterday afternoon in the presence of a large number of persons to ascend in the balloon brought out here by Capt Lovelace, but on account of the contrary wind, the effort failed. Another trial will be made this morning at 8 o'clock. Captain Lovelace went up in his balloon yesterday afternoon and, needless to say, the ascent attracted a large crowd. The balloon started from the Gas Works and came over towards Orange and Port Royal Streets. 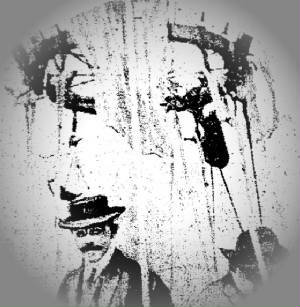 Several pictures of the city were taken, the balloon being guided by a rope from the ground. It came in contact with a pole in Port Royal Street, however, and the descent was quicker than the ascent, anyway. Captain T T Lovelace, who recently arrived here with a balloon for the purpose of taking photographs, sailed in the Siberia yesterday for New York. The many friends of Captain Lovelace, late of the gunboat Orienta, will be sorry to hear of his having been shot in the attempt at revolution in Venzuela says the Colon Telegraph for March 9th. Captain Lovelace, as a matter of fact, sailed from Kingston last night for New York. Capt Lovelace Talks on Balloons. Capt. T. T. Lovelace, who did not sail as commander of Ralph Brandreth's yawl Taormina on its trip around the world, gave an illustrated lecture last evening before the members of the Aero Club of America at 12 East Forty-second Street on his balloon experiences in Jamaica last month. Capt. Lovelace visited Kingston shortly after the earthquake and took a number of pictures from the balloon over the stricken city, and these he showed for the first time since returning to New York. and the best possible pictures. When I arrived in Kingston the gasometer at the gas station in Kingston had heeled over to a forty-five degree angle; but it had in sufficient gas to inflate the balloon. Six hours after my arrival I was up in the air. I took aerial photographs of the entire area, of the earthquake and made other scientific observations, as instructed, and forwarded the data and the photographs to New York and Berlin where they were reproduced in scientific journals. During my visit here in 1907 I wrote a series of articles for a New York magazine on the fishing industry, because in the air I could see to the bottom of the waters around Port Royal. For this thesis Admiral C. M. Chester of the Navy Department of the United States took the data, wrote scientific articles, and gave me credit of being the man who discovered that sunken objects could be discovered by the use of a balloon or a dirigible airship. This photo of ruined buildings on Harbour Street appears to have been taken from a balloon, presumably that of Capt. Lovelace. Unfortunately I have not, so far, been able to track down the location of the entire set of aerial photos Lovelace took in Kingston in 1907. If they can be located they will form an interesting part of the history of photography and aviation in Jamaica, as well as of the earthquake. From here the steamer proceeds to the island of Jamaica, and passing along the coast of the Palisades we noticed two German liners gone ashore with the waves dashing over them. It was understood that they had attempted to navigate into Kingston Harbour without a pilot, with dire results. The previous year, Kingston had been a very busy and crowded seaport, full of life and animation. Now it was a scene of desolation, in fact there was no Kingston, and the population was living in tents. All the buildings were shattered heaps on the ground, and, curiously enough, almost the only stone work left standing was a statue of Queen Victoria, which had been turned round on its pedestal, and left facing in the opposite direction, towards the Church. I climbed up inside the spire of this Church to photograph a general view of the wreckage, though the Dean strongly urged me not to do so as it might fall down at any moment. There had been three distinct quakes, the first being an undulating roll like an advancing wave, the second a shiver, or a gigantic shake, and the third a series of sudden bumps rising and falling on the ground. Numbers were buried beneath the crashing buildings, but the most terrible havoc of all was caused by the fire that followed, and which consumed the wrecked houses, which were nearly all of wood. Numbers of inhabitants pinned down by wreckage and unable to escape were burnt alive. Rescue parties were formed, led by the Governor, and many lives were saved by this means. I obtained films of this scene of disaster and sent them home at once, thus enabling the people at home to realise the magnitude of the catastrophe. Because there was no accommodation to be had ashore, I remained on board and went for a coastal trip. 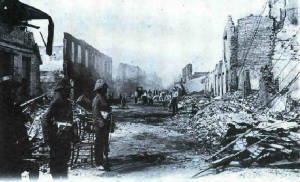 The Governor was also on board, intending to inspect the damage done elsewhere, though it was soon discovered that the rest of the island was quite intact, the full force of the earthquake having been concentrated on Kingston. I obtained pictures round the coast, such as Port Antonio where, in the Titchfield Hotel, there was a large number of sightseeing Americans, and also at Montego Bay. After sailing round the island, we returned to Kingston, and the ship then left for Colon, the Caribbean entrance to the Panama Canal. which happened just before Alfred West arrived on his second visit. Altogether he tells us he recorded some 5,000 feet of film in the West Indies. However he gives no further description unfortunately. My thanks to David Clover, a descendant of A J West, for his help with this information. [NOTES: I had hoped that it might be possible to identify from advertisements in U.K. newspapers times and places for the showing of West's 'newsreel footage' on the 'quake, but I haven't really got on to that project yet!